A few weeks ago I invested in my first Kickstarter project. I did it because, even though I've never had the good fortune to be part of a weekly gaming group, when I was a teen I wanted that very much (even more than I want it to be March 5th!). But none of my friends gamed and the local gaming store was always filled with guys who knew a lot more about gaming than I did. Anyway, for many of my teenage years it was this thing I wanted to experience, but I never could figure out quite how to make it happen. I think that was probably the reason, initially at least, I was drawn to MMORGs (Massively Multiplayer Online Roleplaying Games). Recently I've noticed that a lot of my favorite science fiction and fantasy authors also game. When I saw Jim Butcher's announcement that Evil Hat Productions was having a Kickstarter campain I thought it was the perfect opportunity to indulge the kid in me and learn something about gaming and perhaps figure out why so many awesome authors (especially fantasy, urban fantasy and horror authors) game. A few months ago I wrote the first draft of a novel about magical creatures who are often mistaken for Fae, but who have a magic all their own. That meant I would have to create a magical system for their world but I had no idea how, so I put the project aside. Now, after skimming through the Magic Systems Toolkit file all I can say is thank goodness I invested in that Kickstarter! I'm beginning to understand why fantasy writers love gaming, or why they grow from gaming. It's probably a chicken and egg thing: does gaming produce fantasy writers or are fantasy writers attracted to gaming because it helps them create and populate their magical worlds? It may sound odd, but when I wrote about magic in the past I hadn't asked the question, "What is Magic and how does it work?" I'd never considered what rules might govern magic in my created world. So, lets! Before I read the Magic System Kit I had no idea how many different sorts of magic systems were possible. For instance, you could have what for lack of a better term I'll call scientific magic. Arthur C. Clark thought that any sufficiently advanced technology would be indistinguishable from magic. On this view magical forces are, fundamentally, physical forces that we don't know much about at the moment. However because they are physical forces they could be expected to behave something like the physical forces we know about. Or we could think of magic more like a "system of prices, risks and rewards". For instance, magic could be like an algebraic equation where, because both sides have to balance, if (on the one side) you use magic you have to take something from the other. Energy, a sacrifice, dead plants, whatever. Where does magic itself come from? Are there fundamentally different sorts/kinds/types of magic? Is some magic light and some dark? Does the flavor of magic depend on who is using it or what the source is? I won't have time to cover all these today so let's just talk about Tone. Is magic a mindless, unthinking, force like the electromagnetic force? If it is, then its action will solely be determined by a thing's physical properties. In this case, casting--using magic--could be like a recipe. Get the right physical ingredients together, do the right things, say the proper words (preferably in Latin), and presto! Magic will happen. If inert, neutral, magic lies on one end of the spectrum what lies on the other? According to the FATE system, two things: flavored magic and opinionated magic. Flavored magic can come in varieties, such as dark and light, and may operate differently depending upon which end of the spectrum the magic user draws from. On this view the spells themselves--the magic used in the working on them--would be dark or light, though this could be a matter of degrees. Flavored magic isn't intelligent, but it does have tendencies. Just as fire tends to burn and earth tends to be stable, flavored magic tends toward certain things but what sorts of things those are is up to you. For instance one way magic could be flavored is by being either light, dark or some combination of the two. What's great about the FATE system, though, is that it doesn't have to be flavored light or dark, you can let your imagination go wild. Perhaps instead of being tied to our conceptions of good and bad it could be tied to emotions, or passion, or times of the year. The possibilities are endless! Opinionated magic comes from someone. It requires an agent, someone with both intelligence and the will to wield it. Often the magic users I write about are like this. They are born with magical ability, they just need to learn how to access and control it. On this view the agent/being might use neutral magic or flavored magic. Also, the magic itself could be shaped by the casters thoughts, personality or will. A group of tipsy teenagers invade their crotchety neighbors house--the ancient one that looks haunted--on a dare and steal an odd looking book which turns out to be (surprise!) a book of spells. Neutral magic: On this view anyone can work magic if he or she has the right ingredients and follows the spell. Therefore, in our little example story, any one of the teenagers could use the book of spells to work magic. The spells wouldn't be good or bad, it would all depend on what the magic user(s) did with them. A group of tipsy teenagers invade their crotchety neighbors house and steal an ancient book bound in leather. The writing is faded and the ink used seems ... peculiar. Opinionated magic: The teenagers break into the creepy house and meet its even creepier owner, a crotchety old man. The old man turns out to be a powerful wizard and turns all of them, except for one, into purple chickens. The one he spared, let's call him Kevin, he did so because he recognized the boy had the potential to become a powerful wizard. The old wizard makes Kevin kill and cook all the chickens for his evening meals but spares one, the one that was Kevin's girlfriend. The wizard promises Kevin that the day he is able to transform his girlfriend back the way she was that he'll be free to leave. In this version of the story there's no spellbook. The old man doesn't need one, the magic lives within him. That's convenient but the downside is he hasn't been able to find a worthy apprentice because working magic takes more than intelligence and determination; raw skill is required. That's what Kevin has. However learning magic, having it come alive inside one, changes a person and the old man knows that by the time Kevin has the ability to make his girlfriend as she was he will not be the same person. Will he still want his girlfriend back or would he rather have a nice, light, snack? Well, that's it! At least, that's it for magic tone, tomorrow we'll go over cost, limits, availability and source. Have you done any old school (something requiring a pencil and paper) role playing? If so, tell us about it! 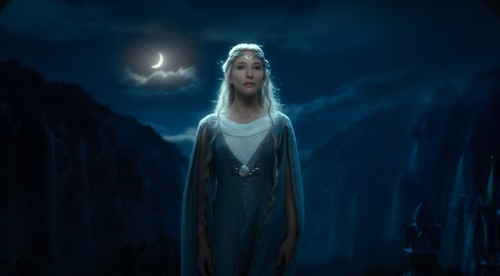 Photo credit: Still of Cate Blanchett as Galadriel in The Hobbit: An Unexpected Journey. Copyright © 2012 Warner Bros. Entertainment Inc. and Metro-Goldwyn-Mayer Pictures Inc. (US, Canada & New Line Foreign Territories). Rationale for the fair use of this image: - The image is being used in an informative way and should not detract from the film - The image does not limit one's ability to sell or show the film. LARP does seem fun! Jim Butcher LARPs--he did an interview in costume once because he was in the middle of a game. "Muse food," love that expression! Most of my RPGing was with Shadowrun, which is a dicechucking game rather than a p&p. My group pretty much used it as an excuse to act the role of ridiculous characters. It was an unspoken attempt to see who could earn the most laughs. One of the best aspects to a good magic system is cost. Especially when the cost is high, characters/players have to make meaningful choices. Another important aspect is limitations. A good example of that would be Brandon Sanderson's Mistborn series. The magic is so limited, each 'element' of magic has one specific effect, and no more. This forces his characters to be creative, rather than making them weak. Yes, I'm beginning to see that. Limitations, at least in storytelling, are a great thing.